KISS! NSU commemorates the band’s deep history on trading cards ALSO INSIDE–Our brand new column spotlighting your favorite sketch card creators, a look at Upper Deck’s upcoming James Bond series, and much more. Your editor examines some sketchy things about the hobby. 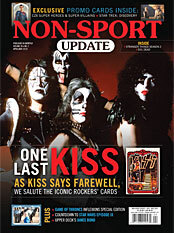 Commemorate KISS’ End of the Road Tour with card sets old and new. We get the draw on two KISS sketch artists in our newest column. Rittenhouse promises this one will be a Game changer. James Bond gets the upper hand at Upper Deck. Fans can bop till they drop with these ‘80s hits. The 32-page A-Z Price Guide covers all relevant trading card releases from Agents of SHIELD to Xena Warrior Princess! Let’s celebrate garbage! Garbage Pail Kids, that is. We’ll look at the classic originals. Also, a look at upcoming X-Files releases from Upper Deck, the classic Planet of the Apes cards from 1969, and Rittenhouse Archives’ upcoming Twilight Zone release.